TEMPE, AZ--(Marketwired - September 23, 2016) - E&E Exhibit Solutions just announced the refurbishing of their trade show rental exhibits to include a Powder Coating finish that resists corrosion, impact, abrasion, chipping, and fading. Powder Coating is an advanced method of finishing that is far superior to liquid paint as well as being environmentally-friendly, durable and longer lasting. "Our rental inventory of trade show displays has been extremely popular," said Daniel Chaddock, President of E&E Exhibit Solutions. 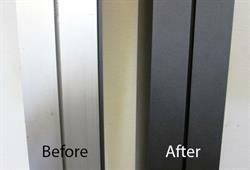 "By Powder Coating our aluminum extrusions, we have literally transformed our custom rental inventory overnight. Many of our rental customers have challenged us to offer an alternative to the over-used aluminum extrusion, and we have responded by offering a richer, dark gray tone which we believe will frame the graphic messages most effectively." 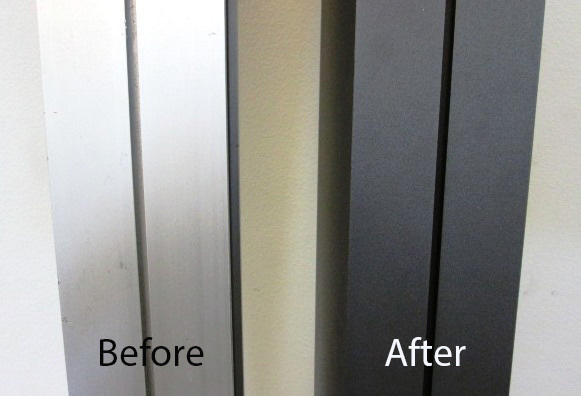 The Powder Coating used on the E&E Exhibit Solutions rental inventory is a dark metallic gray color that was cured for ten minutes minimum to ensure a finish that resists corrosion, abrasion, and chipping even in extreme conditions. Each metal piece will sustain its new appearance, even though it will be utilized in many upcoming rental design solutions in the future. "The average cost to attend trade shows is often a large portion of the annual marketing budget," said Cynthia Chaddock, CFO/Director of Marketing, E&E Exhibit Solutions. 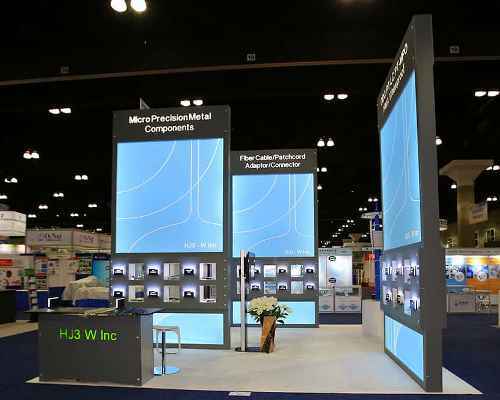 "We continue to expand and improve our rental displays so that businesses have options when it comes to their trade show displays." The trade show exhibit rentals available from E&E encompass entire display solutions including furniture, flooring, kiosks, hanging signs and more. Customize all display rentals with your company colors, logo, branding and display graphics. To learn more about trade show exhibit rentals from E&E Exhibit Solutions, visit www.ExhibitsUSA.com. Or contact E&E Exhibit Solutions by calling 800-709-6935. Since 1995, the custom display design professionals and award winning leaders in trade show exhibits at www.ExhibitsUSA.com and www.RentExhibitsUSA.com have been working with businesses to create memorable and functional design elements and trade show displays for their businesses. Contact Information: 800-709-6935 info@exhibitsusa.com.